February 2017 Snook season is strong. February 2017 Snook season is strong. With the warm winter comes warm water temps. Normally I would not even think about Snook in February. But since the 1st. of February we have had a good Snook bite almost everyday. The Snook have been eating live Shrimp and Threadfins. It has been an amazing month. Makes me wonder if there will be any fish left for March – May. One thing I know is that the boat traffic is also at a all time high. I have seen a few Manta Rays up and down the beach. Only a couple of Cobia on them. With the warm water temps who knows what to expect for the Cobia run this year. Will they be to spread out? 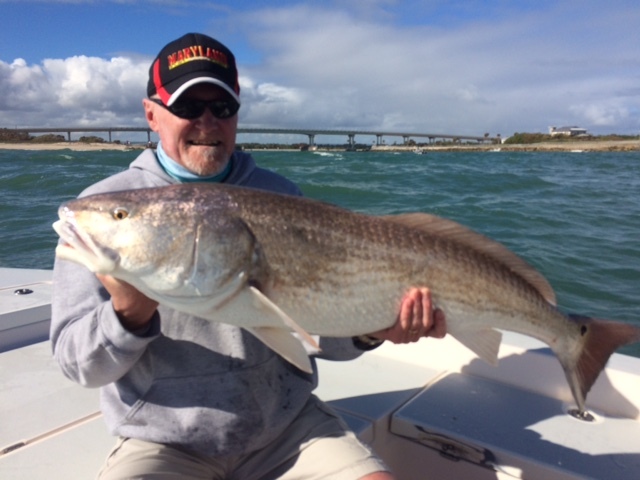 There also has been some big Redfish in the Sebastian Inlet. 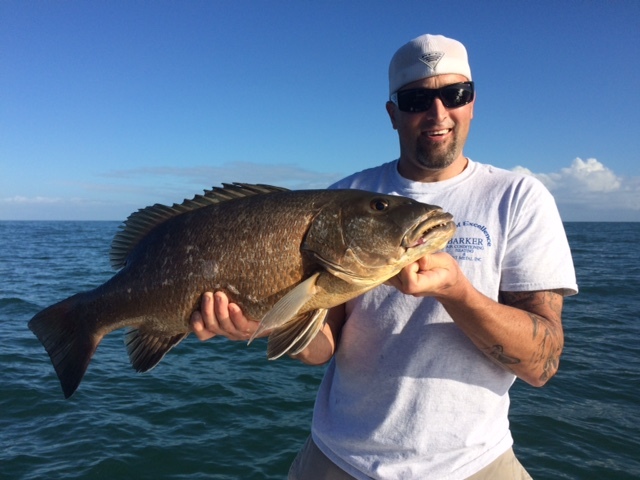 Anglers are also catching a fair share of Black Drum and Sheepshead on shrimp. Thanks again to everyone who has fished with m in the past. I really do appreciate the support and trust! Happy New Year everyone. 2017 is off to a great start. The water temp. is still around 70. 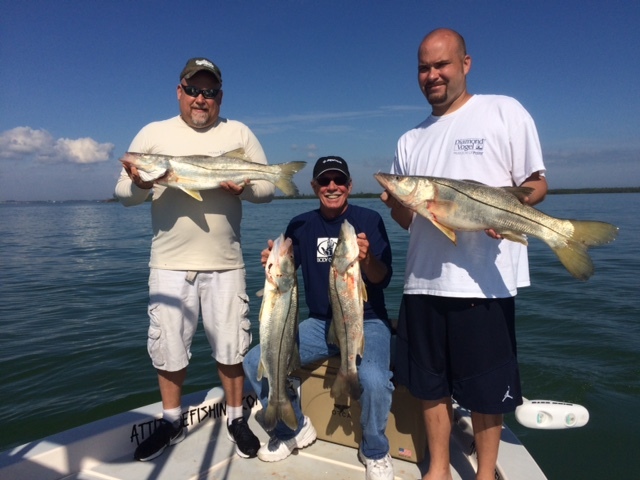 It is January and the Snook are still chewing. There are a few Redfish biting. The Pompano bite has been decent. Pink and yellow swim jigs are the hot color. It has been a little windy so the ocean has been kind of rough. But the few days that it has been calm there have been good reports of Triple Tail, Cobia, and Kingfish. 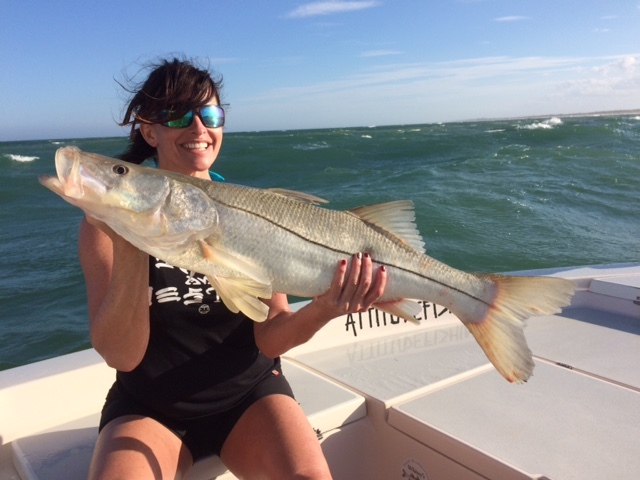 Most years in January around the Sebastian Inlet there are lots of Jacks, Bluefish, and Spanish but with the warm water temp. we have seen very few. I just hope that this does not mean we are in store for a late winter. Sebastian Inlet Pompano and Snook. Happy Holidays to everyone. Hope everyone has a great Christmas. I had a wonderful Christmas. The fishing is pretty good if you can get a break in the weather. Catch and release but the Snook bite is still on. The Pompano bite seems to have gotten pretty productive as well the past few days. The weather has been pretty windy so not to many boats getting offshore. 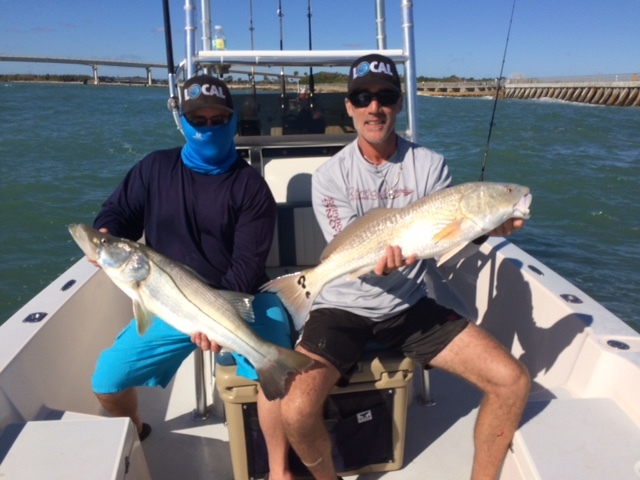 Lots of small Jacks in the Sebastian Inlet. I just want to say to everyone who has fished with me this past year, THANK YOU!!! I really appreciate your support and helping me live a dream. I wish you a happy New Year! and I promise to continue to work hard and keep Attitudefishing on top of the game in 2017. Thanks again for a great year!!!!!!! 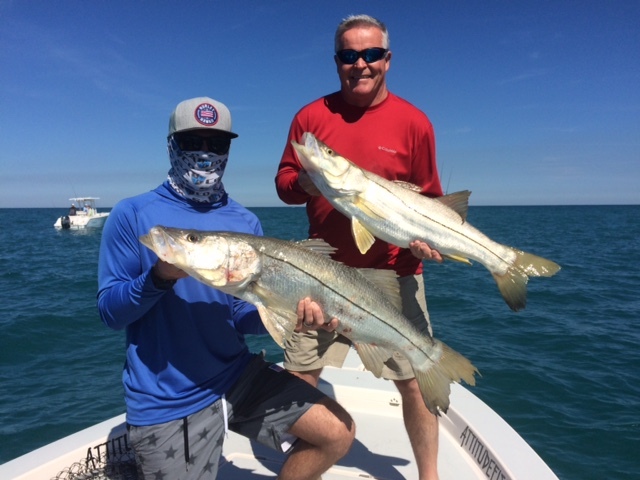 2016 Fall Snook season closes. This was by far the best Snook season that I have been a part of. We caught more Keeper fish this season than ever before. We limited out almost every trip. If this is a sign of what to expect for the future of Snook fishing then I am a happy camper. The fish were biting right up to the closing and will continue to chew as long as the water temp stays above 7o. There has been some decent reports of Flounder being caught around the Sebastian Inlet. Pompano have been showing up in a few spots in the river. I have also noticed that the Bluefish are starting to show back up. It is that time of year, the snowbird fish. Thanks to everyone who helped make my Snook season a success and also I would like to wish you a Merry Christmas! The Snook fishing is still red hot. The Attitude Adjustment has had some pretty incredible days. I have not seen Snook fishing this good probably ever. The Black drum are pretty thick as well. They are taking live Shrimp. The weather conditions have been a little windy and the ocean is blown out but we have had a few days that have been doable. I have not been offshore. I have heard of some decent Triple Tail and a few Cobia on the weed patches. The Flounder are starting to show up inside the Sebastian Inlet. There has been a few good reports the past few days. Thanks again to everyone who has fished with attitude the past week, I am very thankful. I wish everyone and there families a Happy Thanksgiving!!! 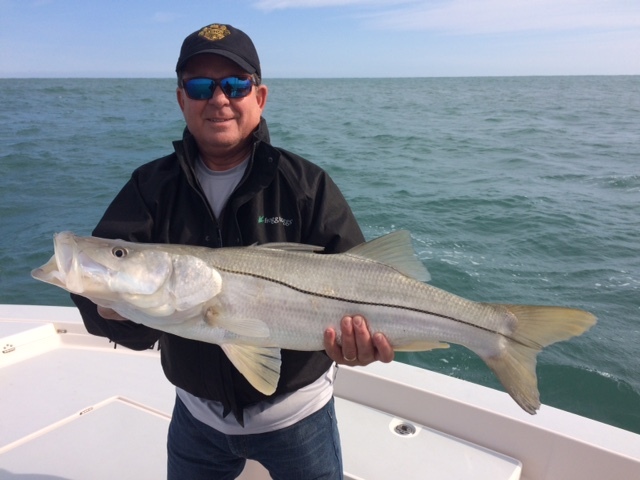 November Snook action is all time for Attitude Adjustment. The Snook bite continues to be one of the best I have seen in a long time. All baits are working. The black Drum are also taking live shrimp. The Jetty is still closed. The weather has been a little rough though. It has been very windy for weeks now. The few days that it laid down there were a few Cobia and Triple Tail being caught. The Redfish bite has been strong. There also has been some Flounder starting to show. Thanks again to everyone who has fished aboard the Attitude Adjustment the past few weeks. It has been a lot of fun with non-stop action! A month left of Snook season lets see if we can finish strong. 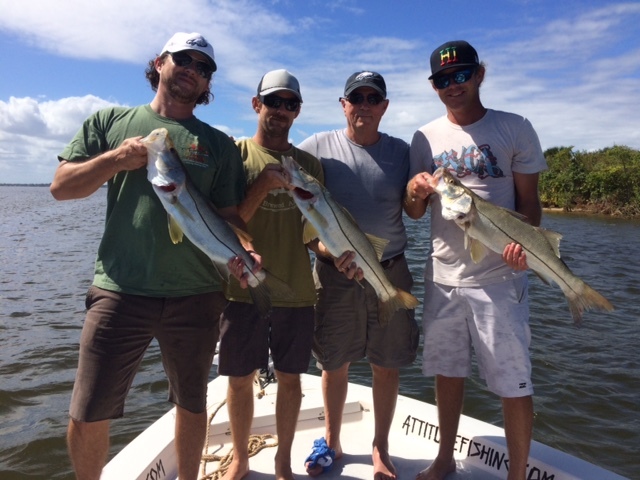 Fall Snook action is on fire at Sebastian Inlet. The winds are still blowing hard and the ocean is still a washer machine. So the offshore fishing has not been doable. Thank god for the Snook fishing at the Sebastian Inlet though. It has been absolutely on fire. Bait is another story though. It has been difficult. Pinfish and Pigs are working best if you can find them. The river has been producing a few Snook and some smaller Trout. We should start seeing the Flounder turn on now that fall is here. Thanks to everyone who has fished with attitude the past couple of weeks. I would not be living my dream with out the support so for that I am very grateful. Thanks again!!! Sebastian Inlet, Snook, Snook, and more Snook. The winds have not stopped. It has been really windy for the past few weeks. We have had our first cold front move through. The end of October is here. With the windy conditions the Offshore fishing has not been doable. The river fishing has been decent. Some Jacks, Trout, and a few Smaller Snook. 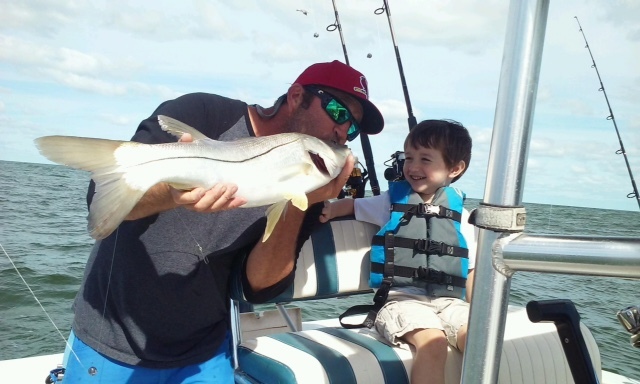 The Snook fishing around the Sebastian Inlet has been on fire. Bait has been really difficult but if you can find them the fishing is good. Jacks have been thick on the incoming tide. With another cold front or two we should expect the smaller Gulf Flounder(3 spots) to start moving in followed by the larger Southern Flounder. Mid October and post Hurricane Mathew. The Sebastian Inlet area dodged a bullet. Hurricane Mathew definitely gave us a scare. Minimum damage to the area. The Attitude Adjustment was untouched. Water levels are high still and the winds still have not stopped. The fishing is as good as it gets right now though. The Snook are on fire ever since the storm. The Mullet run is in full swing and there is mullet everywhere. 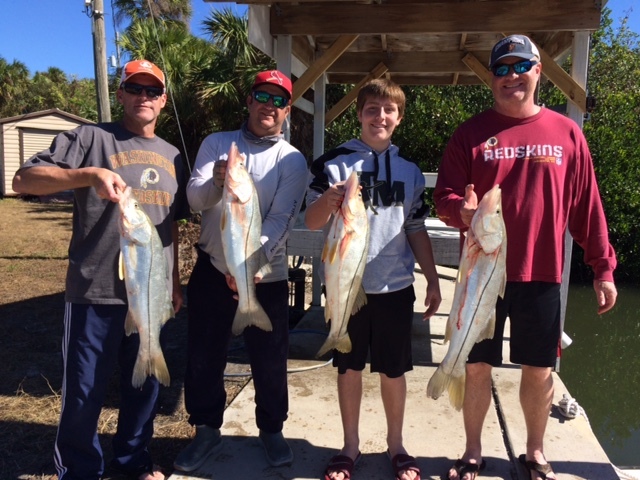 Snook, Jacks, and Redfish are eating like there is no tomorrow. Offshore- With the conditions being so rough and the swells no one is fishing offshore so no reports. Thanks to all of my clients(friends) who checked on me and my family during the storm. It means a great deal to me that you think of us. Thanks again!